Your go-to guide on how to communicate with employees. From print to online channels, from leader communication to social media, 49 ways covers all the essentials of employee communication. Looking to make your employee communication efforts more effective? 49 ways will show you how to make immediate improvements, plan for long-term success and measure the effectiveness of your efforts. 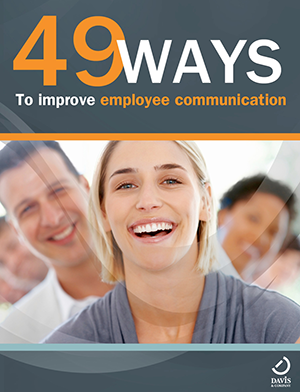 From print to online channels, from leader communication to social media, 49 ways covers all the essentials of employee communication. How can this e-book help you? This guide will help you improve critical aspects of employee communication—from planning objectives to executing tactics to measuring success. You’ll learn both practical tips you can put to work immediately and inspiration for future enhancements. This e-book is delivered in MOBI format for Kindle Reader device or app. > Need the iPad version?